When efforts aimed at the establishment of this great cultural endeavour – the Warsaw Symphony Orchestra – have commenced, they were, and still are to this very day, driven by a single objective – to create a unique entity on the cultural map of Poland, a family initiative spanning across multiple generations which would radiate upon all aspects of life, making a contribution towards the spiritual reinforcement and rebirth of society and humanity alike. Culture is a form of self-expression of mankind. A way in which man can reassert his very humanity. an act of self-inception accomplished through the inner labour of the spirit, the mind, the will and the heart. Yet man does not create culture alone – he brings it to life in conjunction with others. Culture is an expression of communication between people, of common thought and common action. It is forged for the sake of the common good, becoming the fundamental commodity of the communities that comprise humankind. Culture is, first and foremost, the common heritage of the nation that creates it. Polish culture is the foundation upon which rests the spiritual existence of all Poles. a force more potent that any tangible powers and any political boundaries. The Orchestra has commenced its activities in 1984 as the "Sonata" Warsaw Children's Orchestra, brought to life by Bogumił Łepecki, who came to be both its conductor, pedagogue and the arranger of the Orchestra's repertoire. In 1988 the Orchestra received the "Golden Fir" – the first prize on the International School-age Youth Culture Festival in the Kielce Philharmonic. In the years 1989 – 1991 the Orchestra toured France, Belgium and Sweden, with a total of nearly 70 live performances, including a concert at the Basilica of St. Pius X in Lourdes, attended by 25 thousand pilgrims from all over the world, or at the L'église Sainte-Marie-Madeleine in Paris. Its performance at the LES 7-EMES ORCHESTRADES EUROPEENNES – BRIEVE Festival, held under the auspices of the President of France, was a spectacular success. After that the Orchestra has attracted considerable interest during its performances in Warsaw, in the Mazowieckie Province and across the whole of Poland, resulting in an invitation by Ms. Maria Fołtyn for the 29th International Stanisław Moniuszko Festival, where it appeared amongst the most eminent Polish artists. In 1991, the Orchestra was reformed into a small symphonic ensemble, which has toured Germany three times in the years 1991—1993, gaining considerable acclaim, as evidenced by the rapturous reviews in the German press. At that time the first violinist of the Orchestra was Mariusz Patyra, the most gifted young violin player of young generation and the only Pole in history who has managed to win the Niccolo Paganini Violin Competition in Genoa. In the period between 1995 and 2012, "Sonata" received many requests to play during official celebrations, including those with an international dimension, resulting in another international tour in 1994 – this time the destination was Israel. The Orchestra also invited the Israeli Youth Orchestra of the City of Lod to play a joint concert in Warsaw; other orchestras to be invited to perform live in Poland were the Bonn Youth Symphony Orchestra from Germany and the Swedish Youth Symphony Orchestra from Ostersund. Throughout its history, the "Sonata" Bogumił Łepecki Warsaw Symphony Orchestra had the honour to perform under the auspices of the Polish Prime Ministers, the Marshals of the Polish Sejm, the Primate of Poland, the Papal Legate in Poland, Field Bishops of the Polish Armed Forces, Polish Bishops and Archbishops of the Catholic Church and the Evangelical Church as well as many Polish and foreign ambassadors, including the ambassadors of Ireland, Austria, and Israel. A number of events have occurred in the history of the Orchestra which held a particular significance, including the Special Symphonic Concert during the official celebrations of the 50th anniversary of the Warsaw Ghetto Uprising (1993) at the Church of All Saints in Warsaw, as well as the Special Symphonic Concert on the main day of celebrations marking the 50th anniversary of the Warsaw Uprising (1994) at the Grand Theatre – National Opera. In 1995, Bogumił Łepecki was awarded the Knight's Cross of Polonia Restituta by the President of the Republic of Poland, Lech Wałęsa, for the struggle for the independence and sovereignty of Poland. In years 1995 – 2001 the Orchestra went through a period of reorganization both in terms of its structure and artistic character, playing many independent concerts, both in Poland and all across Europe, including Lithuania (1997) and the United Kingdom (1998). In the period between 2001 and 2003 the Orchestra underwent further artistic and institutional restructuring. An event of great stature and significance which took place at that time was the live performance marking the 25th anniversary of the pontificate of His Holiness John Paul II on October 19, 2003 in Warsaw, at the Museum of the John Paul II Collection, attended by 46 ambassadors from all over the world and held under the auspices of His Eminence Cardinal Józef Glemp, the Primate of Poland, and His Excellency Archbishop Józef Kowalczyk, the Apostolic Nuncio in Poland. In the years 1995 – 2005 the Orchestra, through its live performances, implemented its very own programme named "Culture and Heritage in the teachings of John Paul II". In the years 2000 – 2005 the Orchestra, through a number of benefit concerts, has successfully participated in the National Scheme Against Cancer along with the Polish Oncology Union and the Maria Skłodowska-Curie Institute of Oncology in Warsaw. In 2002, the Orchestra was named after Bogumił Łepecki as an expression of gratitude and esteem for its creator and long-time conductor. In 2004, the Orchestra visited Mexico, participating in the 7th Festival Cultural de Mayo Jalisco – Mexico 2004, representing Polish culture as the sole Polish entrant. Throughout the period of its activity, the "Sonata" Warsaw Symphony Orchestra has made a total of 10 international artistic tours, visiting Europe, the Middle East and North America, participating in a number of prestigious events, including festivals held in Brieve (France) and Guadalajara (Mexico). The total number of concerts played by the Orchestra in its history in numerous locations both in Poland and worldwide amounts to more than 600 events. The cities visited by the Orchestra include Paris, London, Stockholm, Vienna, Tel Aviv, Guadalajara, Essen, Duisburg, Recklinghausen, Birstonas, Ostersund, Warsaw, Cracow, Wrocław, Gdynia, Katowice and many others. Its live performances have attracted a total of 500 thousand people, while a dozen-odd million further listeners were able to share in the experience by watching the concerts on television. In years 2002—2012, the Orchestra embarked upon a project which involved live symphonic performances aimed at promoting the tradition and history of the Polish Arms and War Effort and national defence as well as building the image of the Polish Armed Forces both domestically and worldwide. The Orchestra has also made a lasting impact in many parts of the world, its performances etched deep into the memory of the Polish diaspora and many war veteran organizations both in Poland and abroad. - The Warsaw Uprising Medal awarded by the Worldwide Association of the Soldiers of the Polish Home Army. On April 8, 2005, "Sonata", as the only orchestra in Poland and with the consent of the Polish Episcopate, paid its homage to the Holy Father two hours before the main funeral ceremony has commenced at the Vatican, by performing a special concert in the Church of St. Anne in Warsaw, recorded and subsequently aired by the Polish Television (TVP) Channel 1 and TV Polonia at 7.00 in the morning. During this concert the Orchestra performed an eminent work of sacral music – "The Seven Last Words of Christ", an oratorio by Joseph Haydn. In the years 2005 – 2011 this resplendent oratorio was played in all 18 city districts of Warsaw and in 17 cities of the Mazowieckie Province on the first, second, third, fourth, fifth and sixth anniversary of the passing of the Pope, each time held under the honorary auspices of the mayors of the 18 Warsaw city districts and the 17 cities of the Mazowieckie Province - Góra Kalwaria, Lesznowola, Józefów, Szydłowiec, Piastów, Ciechanów, Anin, Tłuszcz, Ożarów Mazowiecki, Karczew, Ostrołęka, Radom, Tarczyn, Grójec and Mińsk Mazowiecki as well as Wysokie Mazowieckie in the Podlaskie Province and Ruda Śląska in the Śląskie Province. performed during the Laurel of Skill and Competence Award Ceremony at the House of Music and Dance in Zabrze and featuring Dina Joffe, a soloist, winner of the second prize in the 1975 International Chopin Piano Competition. Both events were subsequently published as limited edition DVDs. The concerts were recorded and transmitted live; in addition, they were retransmitted in three provinces of southern Poland. In 2006, another important event took place as the Orchestra played a Special Symphonic Concert during the celebrations of the Day of the Veteran held at the Presidential Palace, in the presence of the President of the Republic of Poland. 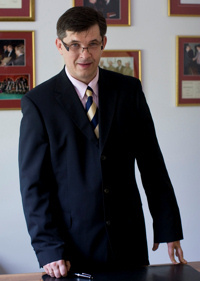 In 1989, at the request of the founder of the "Sonata" Orchestra, Bogumił Łepecki, his son, Jacek Łepecki, became the Managing Director of the Orchestra; since 2001, he alone has been in charge of this cultural institution, which has already earned its place among entities that play a pivotal role for Polish culture. The event referred to above took place on May 14, 2007, when the "Sonata" Warsaw Symphony Orchestra performed a special symphonic concert during the celebrations of the Year of General Władysław Anders, under honorary auspices of His Excellency the Evangelic Bishop of the Armed Forces, Brigadier General, Ryszard Borski. The performance was recorded by Polish Television and was aired nationwide on Channel 2 of the TVP as well as on TV Polonia, on August 15, 2007, the day of the Polish Armed Forces, from 8.55 to 9.55 – the time of Polish Television coverage of the celebrations taking place at the Tomb of the Unknown Soldier. Another illustrious event in the history of the Orchestra has been the symphonic performance under the honorary auspices of Andrzej Błasik, the Commander of the Polish Air Force, General of Arms (and a pilot himself), entitled "Young Poles for Polish Airmen – In Memoriam", played in Mirosławiec – the place where a number of Polish airmen died tragically in a plane crash. This concert was transmitted by the regional branch of the Polish Television in Szczecin on March 30, 2008. Yet another event of great significance has been the symphonic concert played on the 260th anniversary of the birthday of Tadeusz Kościuszko and the 230th anniversary of the American Declaration of Independence; this event was held under the honorary auspices of His Excellency, Division General Dr Tadeusz Płoski, Field Bishop of the Polish Armed Forces. A number of important Guests, including the Minister of National Defence of the Republic of Poland and the US Ambassador in Poland, have attended the ceremony. Throughout its history which spans nearly three decades, the Orchestra has also played – and continues to play – an important educational role, since during that time many musicians who played concerts with the "Sonata" Orchestra have managed to enhance their musical skills, becoming full-fledged professional musicians and subsequently lending their abilities to many Institutions of National Culture. The year 2009 was a year of jubilee celebrations, and therefore the Orchestra's live performance schedule was arranged in a manner which allowed listeners in both Warsaw and many cities of the Mazowieckie Province to become acquainted with the works of Polish composers: Emil Młynarski, Karol Kurpiński, Karol Szymanowski, Stanisław Moniuszko, Józef Elsner and Frédéric Chopin. In order to commemorate the 100th anniversary of the death of the composer Mieczysław Karłowicz, the Orchestra performed "Rebirth" – the Symphony in E-minor, Op. 7 by Mieczysław Karłowicz. The concert took place in Warsaw. In 2010, Mr. Jacek Łepecki was awarded the Knight's Cross of Polonia Restituta by the President of the Republic of Poland, Bronisław Komorowski, at the request of the Chapter of the Order of Polonia Restituta, for exceptional merit in the promotion and dissemination of musical culture and for his services to the veteran community. Other important live performances included symphonic concerts played on the anniversary of the Battle of Olszynka Grochowska under the honorary auspices of His Excellency the Archbishop, Division General, Dr Sławoj Leszek Głódź. The year 2010 also marks the beginning of a project (scheduled for years 2011 – 2014) which involves a series of presentations of the musical works of eminent Polish composers who have brought international fame and recognition to our Country and who have made an invaluable contribution to cultural heritage both in Europe and worldwide. by Józef Antoni Franciszek Elsner – composer, conductor and pedagogue, the tutor of Frédéric Chopin himself. The concert was aired on April 14, 2011 on the TVP INFO news channel. In 2012, the Orchestra has played, among others, four symphonic concerts which were performed at the Jarosław Dąbrowski Military Academy of Technology, the Academy of Defence of the Republic of Poland, on the courtyard of the Dernałowicz Palace in Mińsk Mazowiecki as well as at the Polish Armed Forces Conference Centre. "Rebirth" – Symphony in E-minor, Op. 7 by Mieczysław Karłowicz.